So much about eating low-carb/keto is a process. Recently I decided it was time to face up to the ingredients and carb counts in the healthier store-bought ketchup I use and to see if it was really keto approved. It turns out that the ‘natural' ketchup I've been using is sweetened with agave which is terrible for insulin resistance and the keto way of eating. 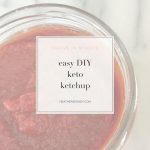 I resolved to clean up my ketchup game, so I created a really yummy and easy DIY keto ketchup recipe. But first, here's why you really should scrutinize your ketchup, especially if you are insulin resistant. Heinz still adds high fructose corn syrup (HFCS) which is one of the worst frankenfood ingredients you can give an insulin resistant body. HFCS deranges an already improperly functioning blood sugar/insulin system in those with IR. Even if you look to healthier ketchup brands, they often aren't much better because they sweeten with Agave. Some brands market sweetening their ketchup with agave as a healthier option because it doesn't raise glucose as much as regular sugar. It's true that agave doesn't raise blood glucose/sugar as much as regular sugar, but that's only because agave is 90% fructose. Fructose is naturally found in fruits where it is accompanied with vitamins and antioxidants and fiber. Agave is a highly processed and super concentrated blast of nearly pure fructose that in the absence of those other natural compounds can cause inflammation, free radicals, makes insulin resistance worse, raises triglycerides, stresses the liver, and causes weight gain – especially around the belly. So if you have blood sugar issues or IR, or just want a healthier alternative do not use any ketchup sweetened with agave or high fructose corn syrup. 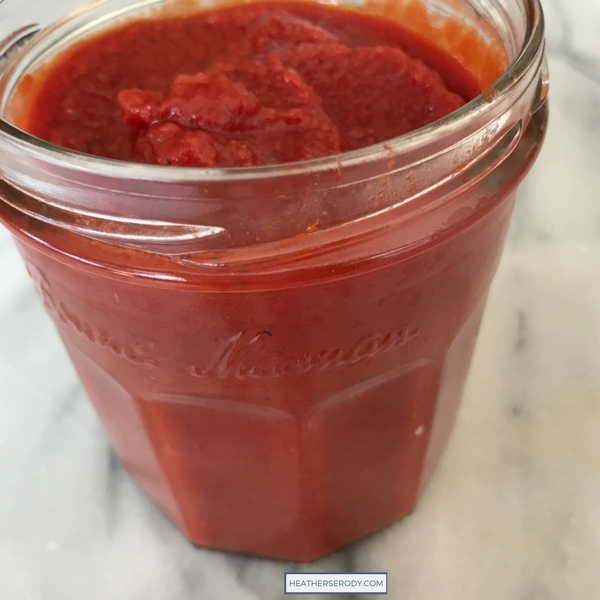 After researching my options, have two choices – buy a relatively expensive store-bought Ketchup brand that is unsweetened or make my own and sweeten it with natural keto approved sweetener. I sourced a fantastic brand of tomato paste with the fewest amount of natural carbs and combined it with luscious extra virgin olive oil and sea salt to really bring out the natural sweetness of this ketchup. After adding spices, it turns out that all this ketchup needed was 10 drops of Stevia Clear sweetener to be perfectly sweet and yummy. Feel free to adjust the sweetness to your own taste. Stevia does not affect blood sugar or insulin levels at all, and the brand I use and recommend is made using a gentle water extraction process with no additives or fillers. 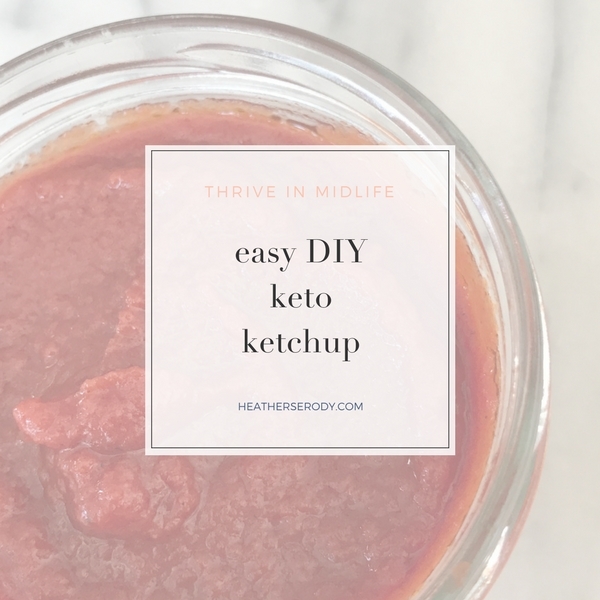 The best part is that this DIY keto ketchup takes just a few minutes to whisk together with no blender needed. It even has more salty sweet tomato-ey flavor than any ketchup I've ever had. Like my easy DIY keto mayo, this is a game changer recipe! Let me know how you like it. Yellow Barn Tomato concentrate is available in store at Whole Foods and online. If you can't source it that way, look for tomato paste with less than 4 g carbs and no added sugar, high fructose corn syrup, or agave. 15 turns of freshly ground black pepper from a mill 1/4 tsp. Combine all ingredients in a medium sized bowl and whisk together well. Keep in a glass covered jar in the refrigerator. Keeps up to two weeks. Note that it is the sherry vinegar that imparts the right flavor tang to this recipe. Do not substitute other types vinegar or it won't taste as good. If you prefer your ketchup a little thinner just add a little bit of water. **Store in the refrigerator in a glass jelly jar for up to 2 weeks. This ketchup will thicken up when cold. Before using, you may want to warm it for about 10-15 seconds in the microwave to warm it and make it easier to spread.